USk Seattle likes to make at least two regular visits to Swansons Nursery each year – autumn and Christmas. This morning was our first visit of the year, and the pumpkins and other fall displays were out in full force. Looking around at all that orange, I then turned around and saw multiple displays of large ceramic planters organized by color. I knew the blue ones would be especially gorgeous if I could also get some pumpkins into the same composition. I walked around for a long time trying to get the blue and orange together while also taking into consideration the direction of the sun, but I just couldn’t make it work. 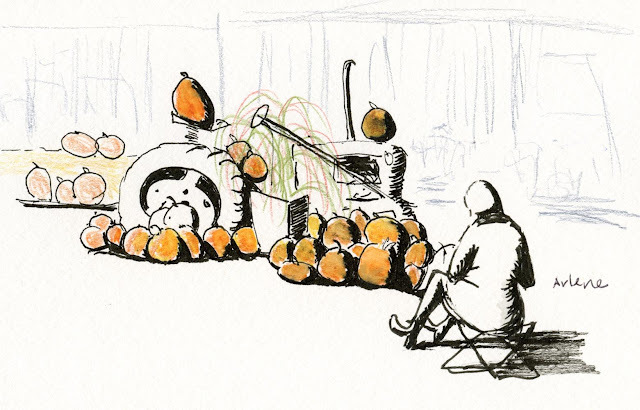 I finally settled for doing two separate sketches – first, the blue planters; then an old tractor filled with pumpkins (along with Arlene sketching them). 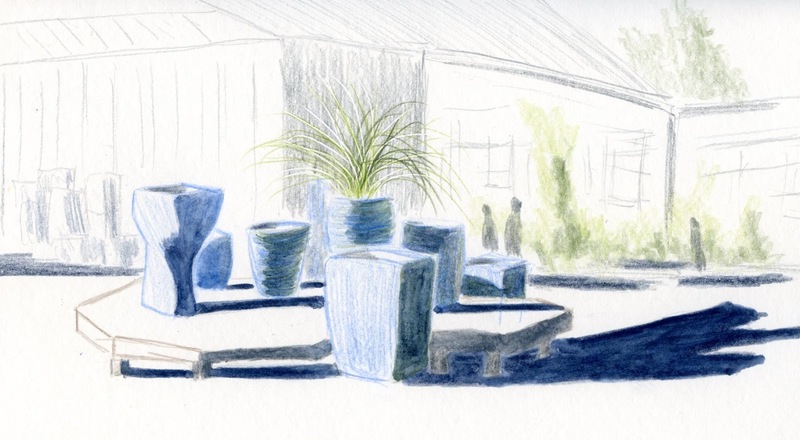 It was a lovely autumn morning for sketching outdoors – mostly sunny and bright (but chilly – I was very happy that I had grabbed my down jacket on the way out the door, especially for the top-down drive home).